Next post: Metaphysical Product Perfection. Cowboys on surfboards. 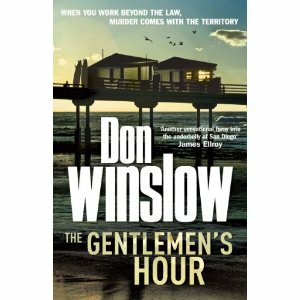 That’s my thumbnail for Don Winslow’s The Gentlemen’s Hour, the second of two novels featuring San Diego surfer slash private investigator Boone Daniels (the first is The Dawn Patrol). For Boone, the PI business just keeps him in board wax. 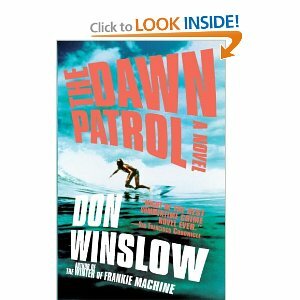 This time around there’s a lot going on in his day job, starting with working for the defense of the worthless little skinhead who killed the god of the beach, Kelly Kuhio, which does not endear Boone to his early morning board buddies, aka the Dawn Patrol. There is the stricken husband hiring Boone to tail his adulterous wife, and the inopportune appearance of Cruz Inglesias, head of one of the biggest and most vicious drug cartels operating on the border. There are distressingly flat seas and disastrous sinkholes and blond bombshell receptionists and crooked records clerks and even crookeder real estate developers and coitus interruptus and coitus finally efficere. Winslow is just one of the best plotting authors around (see The Death and Life of Bobby Z if you don’t believe me) and however improbably, all of these plot strands are gathered together and knotted securely in an epic fistfight, on a beach, naturally. …Like water, earth is always moving. You can’t necessarily see it, you might not feel it, but it’s happening anyway. Beneath our feet, tectonic plates are shifting, faults are widening, quakes are tuning up to rock and roll…Face it — whether we know it or not, we’re all always surfing. It’s not that they’re just taking his water, it’s that they’re taking his life. Without that Rockpile break, what he is is a drywaller, a roofer, a karate instructor in a strip mall. With that break, he’s a surfer, a Rockpile surfer, and it means something. Generally speaking, Boone would have every real estate developer in Southern California put on a bus and driven over the cliff, if it wouldn’t kill the bus driver. If he can find a bus-driving real estate developer, though, it’s on. He already has the camera — it came with the basic Private Investigator Starter Kit along with the cynicism, a manual of one-liners, and a saxophone soundtrack. Yeah, okay, you’ve met this detective before, starting with Sam Spade right up through Spenser, smart, tough, outwardly cynical, inwardly romantic, always irresistible to the ladies. Boone is your average, everyday, ordinary knight of the woeful countenance. But nothing says if it’s done right you don’t want to watch him tilt at another windmill. The day after I finished The Gentlemen’s Hour, I picked it up again and reread the ending, just for that epic joust on the beach. It was, indeed, macking.